Whether you have read the classic Tennessee Williams’ A Street Car Named Desire or watched the film you will never be prepared for the powerful, dramatic performance at the Nuffield Southampton Theatres. A story which follows two sisters Blanche (Kelly Gough) and Stella (Amber James) reunited after years of being apart, unveiling tragedy, loneliness, guilt and violence. The timeless classic was directed by Chelsea Walker who modernised the play with pop music and mainstream costumes; baseball shirts, crop tops and denim shorts. Walker set the scene within a shallow, two room box that contributes towards a climatic ending between Blanche and Stanley (Patrick Knowles). Alongside Walker, the lighting designer Lee Curran and sound designer Giles Thomas came together to create some truly outstanding moments. When Blanche confesses to Mitch (Dexter Flanders) about her traumatic past the audience are emotionally moved through the engulfing jazz music and orange-tinted rose petals falling from the sky. 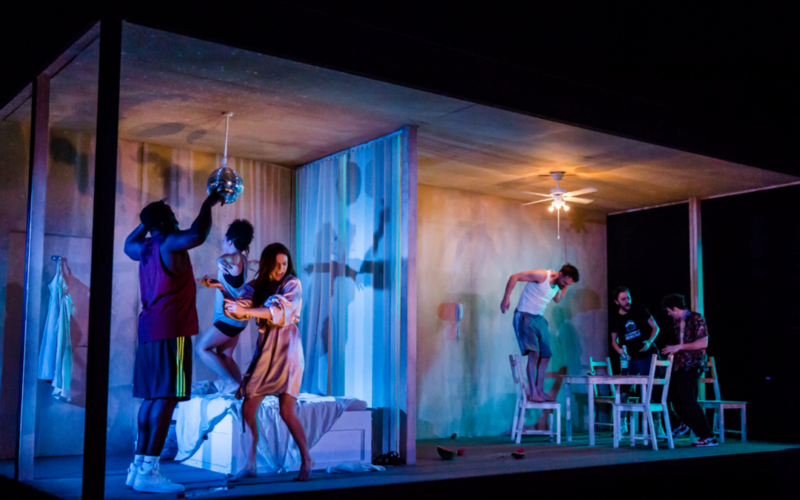 Throughout the play there are small in-significant props; spaghetti being thrown, gored watermelon and a balloon popping, all feeding trauma into the audience and predicting what is coming. The young cast connect with Walker’s adaptation to modernise the play. The outstanding performance of the night must go to Gough, her white-dressed appearance reflecting innocence and purity, distant eyes, slouched shoulders, seductive mannerism all add up to the beautifully depressing character that Tennessee wrote.